Following Madam KOO's release before the rearrest, Cool FM's Freeze, who is one of her die-hard fan, took to his social media account to declare the death of Pentecostal Christianity in Nigeria. 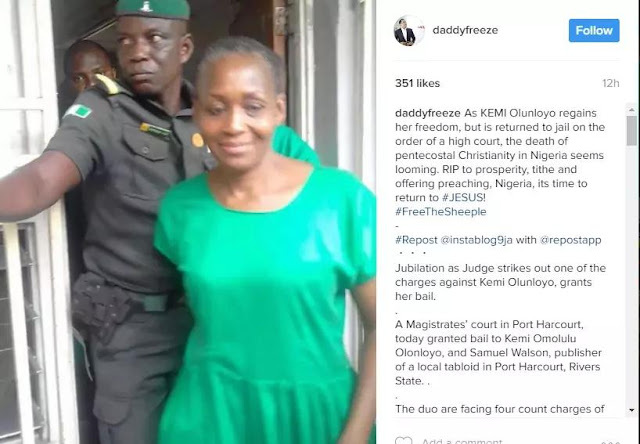 The known for his controversial OAP has this to say, "As KEMI Olunloyo regains her freedom, the death of Pentecostal Christianity in Nigeria seems looming. RIP to prosperity, tithe and offering preaching, Nigeria, its time to return to #JESUS!"